Jerome Paradis is renowned for his ice cream making. At his ice cream parlor in La Tranche Sur Mer in the Vendée there is always a queue for his freshly made, delicious ice creams. Jerome has been making ice cream for many years now and follows a great family tradition spanning 3 generations. I have visited Le Paradis Glacier on several occasions and it was evident from the first that this was an ice cream parlor 'par excellence'. I was keen to know more about the background to this obvious ice cream making expertise so I asked Jerome if we could have a chat. He did not hesitate and kindly made time for me and my list of questions. It was not long before Jerome began to display a passion for ice cream making at a level I have only seen once before - when I interviewed master gelatiere Gino Soldan. Ice cream making is not a job to these people but an art form. It is with Jerome's permission that the essence of our conversation is published here. Visitors to www.ice-cream-recipes.com all love ice cream and I know for certain they will find this insight into master ice cream making of great interest. Photo: Jerome with his father behind the ice cream counter. Jerome first of all explained that working with food was a family tradition, started by his grandfather who was a pastry chef (patissier) living and working near Strasbourg. Years later the family moved to La Tranche Sur Mer in the Vendée, SW France where Jerome grew up watching his father running the family patisserie business. 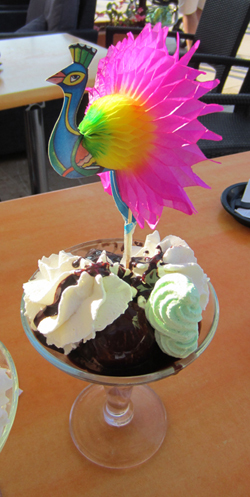 Called "Patisserie Paradis" the main products sold were cakes and pastries, but they also sold fresh ice cream. 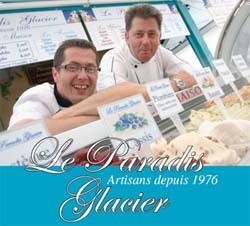 However, it was not long before ice cream became the main focus and in 1976 the business was renamed "Le Paradis Glacier". Jerome began his career as a pastry chef in 1980 and then trained as an ice cream maker in 1990. He worked with his father in the family business for 15 years before then acquiring it himself. Jerome's passion for ice cream is obvious and when I spoke to him he was keen to emphasise how French ice cream is different to Italian ice cream. He referred back to French culture of the 1950's and how it's important, in his view, to have a rich ice cream mix that also contains a good percentage of solids. He clearly takes pride in developing his own ice cream recipes too. His favorite ice cream? Vanilla for which he has his own special recipe! 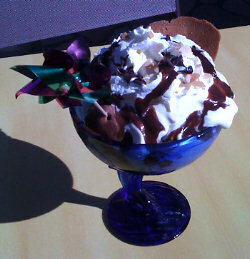 Photo: Chocolat Liegeois (chocolate ice cream sundae) made by Jerome Paradis and eaten by my husband!